New Talavana USA’s largest Ahimsa farm. The New Talavan (Tal · ah · vahn) farm community was begun as a project in June of 1974. This was done at the suggestion of His Divine Grace, A. C. Bhaktivedanta Swami Prabhupada, founder of ISKCON (International Society for Krishna Consciousness.). It is a registered as Non-Profit Organisation under section 501 (c) 3 since 1980 with Tax ID 64-0879824. Talavan is one of the twelve forests around Vrndavana, a city in India where Krishna incarnated 5,000 years ago. 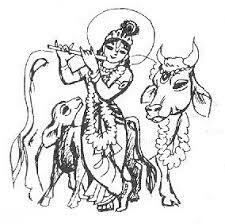 Krishna and His cowherd friends would go there and play, rest, eat and watch their cows as they grazed. At first it was just a few devotees from the New Orleans temple who came out and slowly began planting gardens. They worked as time permitted and then returned to the New Orleans. The first cow was purchased from a stockyard and the devotees named her Kunti. She gave the farm its first fresh milk as well as its first calf, named Subhadra. Later more cows were purchased. The devotees also continued to develop more land over the next 10 years. Eventually we reached a total of 1300 acres. This makes New Talavan the second largest Hare Krishna farm community. New Talavan was chosen as a name by the founder of ISKCON, Srila Prabhupada while he was visiting the Honolulu temple on May 4th, 1976. The fresh milk produced from our cows are primarily used to make offerings to our presiding deities Radha Radha Kantha. The whole farm community is directed to promote Ahimsa and Vedic dharma and in no way comparable to commercial farms where cows are raised to end up in slaughterhouses. As you understand this is an idealistic attempt purely sustained by well-wishers and dharma adhikaris like your kind self. Any support from your end is piety from vedic standards that is carried forward to your next life. Welcome to ISKCON New Talavan outreach department. We are here to educate and propagate the values of cow protection for sustainable living espousing the values of simple living and high thinking and a life centred in self-realization. We have four major focus areas. 1.Promoting Vedic Thinking. (GITA SAMSKARA). This includes free Gita distribution and online classes. 2.Promoting Vedic Dharma. (GO SEVA). This includes adopt a cow program and general cow protection schemes. 3.Food for Life. (ANNA DHANA). This includes temple activities like serving free sanctified food to all visitors on Sunday. GITA SAMSKARA : Promoting inquiry into the topics of Bhagavad Gita. We humbly attempt to bridge the deep chasm between our spiritual and material self. 1. Articles on Vedic Theology and relevance to present day human thinking and science. 2. Online classes on Srimad Bhagavad Gita are conducted every Sunday. Any Questions on how to join the discussions. Send us an email form below or Text (601)385-5450. We appreciate your supporting this cow welfare project that is rooted in spiritual ethics and therefore takes care of the cows, the bulls, the calves (no slaughter EVER!, no separation of mother & babies, no caging, no force-feeding, no production enhancing injections, no GMO feed, Cow Retirement Sanctuary for the non-productive herd and no artificial breeding techniques). Also the pasture lands with no fertilisers being used to feed cows and deities Sri Radha Radhakantha. For any questions or other methods of payment use email form below or Text (601)385-5450. Ways Details to note Need receipt? Donate by Apple Pay to outreach@newtalavana.org. Use this Email form for questions/inquiry (Email sent to outreach@newtalavana.org). We currently have 52 cows, which we take care of with the utmost love and respect throughout their natural lifetime. The farm is run entirely by volunteers, who exchange food and shelter for the upkeep of the farm. We also have a farming project in which we grow organic fruits, vegetables and flowers for preparing food for the deities and distributing as prasadham to all guests. So in this way we are totally a nonprofit religious charitable institution sustained by contributions.Even though we love every second of it, it is not cheap. It takes about $80,000 a year to keep up with all of the costs. We also need to build new infrastructure for visitors and guests, which will cost about $250,000. We also celebrate and share our cow culture with everyone during the annual cow festival. There is a fundraising effort as well. Every penny we make from our annual Cow Festival goes straight towards New Tavalana’s Cow Protection program and running the temple education food relief initiatives. We invite you to enjoy our cow festival. Please inform us in advance to make appropriate arrangements.We also have an Adopt-A-Cow Program. You can adopt a cow and we perform puja for your well-being on the day of your choice. You may also help with our Vedic education for everyone initiative. You are also welcome to participate and learn from it.Any form of a donation goes a long way in promoting this Vedic concept in the western world. All donations are tax-exempt and a receipt will be sent over email or through the representative as desired. For more information on the Adopt-A-Cow Program or general donations email us.